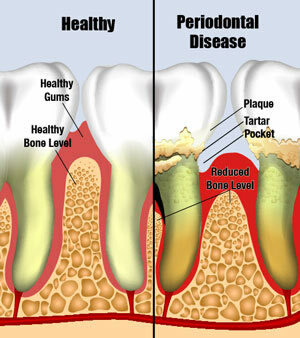 Gum disease also called periodontal disease refers to the infection in your gums( tissue surrounding your teeth). It is quite common and widespread issue that often goes unnoticed among many people. So when bacteria grows in your mouth and starts consuming sugar from your food intake it creates a plaque which forms a thin film over your teeth which is not easily noticeable as its so clear. So if you don’t have good oral hygiene then this plaque will build up and transform to tartar which eventually will result in tooth decay and gum disease. The plaque can be cleaned by yourself but for removing the tartar you will need to visit a dental clinic. First stage : This stage is called Gingivitis in which you will notice inflammation of gums. This can easily be cured if detected early and treated. Stage Two: This stage is called Periodontitis in which your gums and bone can decay permanently if care wasn’t taken in stage one. As gums decay, you can lose teeth as the bone and tissue aren’t strong enough to hold the teeth anymore. Poor oral hygiene, smoking, diabetes, pregnancy, medication such as contraceptives or steroids or even genetics can lead to gum disease. So where we can avoid such catalysts we should take measure and in other cases like pregnancy, genetic or diabetic cases its crucial to monitor your gum condition to detect any changes to that it can be treated in early stage. Gum disease is very common issue and most people experience it, men more than women ! It’s more prevalent among the older people and that’s why regular dental checkup are recommended specially when you get older. But never the less its quite prevalent in younger generation too nowadays, so it’s important to have regular checkup with your dentist. Treatment normally involves scaling and deep cleaning of teeth. If you have Periodontitis (stage 2) then you might be referred to a specialist by your dentist. Prevention is better than cure, so have good oral hygiene, have regular checkups and if you see any sign of gum disease see your dentist so that it can be treated immediately and reverse the effects and avoid any permanent damage.